Top story on S.F. 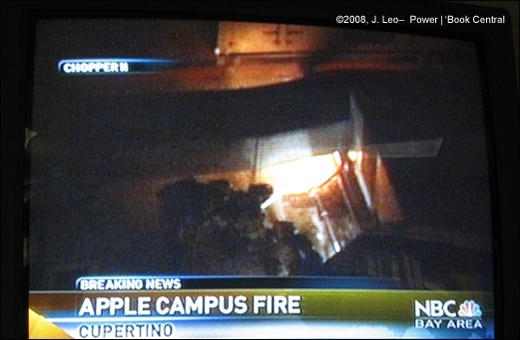 Bay Area news stations: Apple on fire, literally! ONE 'HOT' COMPANY: One of the buildings on Apple's Campus in Cupertino, CA caught on fire tonight, prompting 66 or so firefighters to respond to the scene. Though 100 people were in the building (Apple's research and development unit) at the time, no one was hurt. BREAKING NEWS: 12:35a PDT (8.13.08)-- A 3-alarm fire broke out at one of Apple's Campus buildings earlier tonight (Tuesday, 8/12) in Cupertino, California, as reported by all three news stations in the San Francisco Bay Area. The story was big enough to push aside the top story of the night for the NBC Bay Area station (KNTV 11, San Jose CA), which is always a recap of Olympic coverage highlights of the day. AD: Check out all the "breaking news" on the lowest prices and latest deals on Macs by going to Mac Prices! Find your new Mac, iPod, or iPhone at a great price. According to reports by CBS5 (KPIX 5, San Francisco CA), the fire started at 10:00p PDT at the Apple Campus building on 20605 Valley Drive in Cupertino. Apple's main office, as Mac fans know, is located on One Infinite Loop, and is not the building that was on fire, nor was it affected by tonight's fire. As of this writing, NBC Bay Area reports that the fire is now under control and firefighters from the Santa Clara County Fire Department--with additional aid by the San Jose City Fire Department--are on the scene to "mop up" and assess the damage. NBC Bay Area says that the investigation to the cause of the fire is now under way and Apple representatives could not be reached for comment, though people were inside the building at the time of the fire. CBS5's live reports from the scene as the news broke (as well as raw footage) can be viewed at the link below.